SOUTHERN PINES, N.C. (March 14, 2019) -- Final results from the Ladies' Four-Ball Play Day hosted by Mid Pines Inn and Golf Resort in Southern Pines, N.C. on Wednesday, March 13, 2019. SOUTHERN PINES, N.C. (March 13, 2019) -- Final results from the Ladies' Four-Ball Play Day hosted by Pine Needles Lodge & Golf Club in Southern Pines, N.C. on Tuesday, March 12, 2019. Weston Bell of Piedmont, SC earned medalist honors with a score of one-under-par 69. The cut line fell at three-over par, 73. 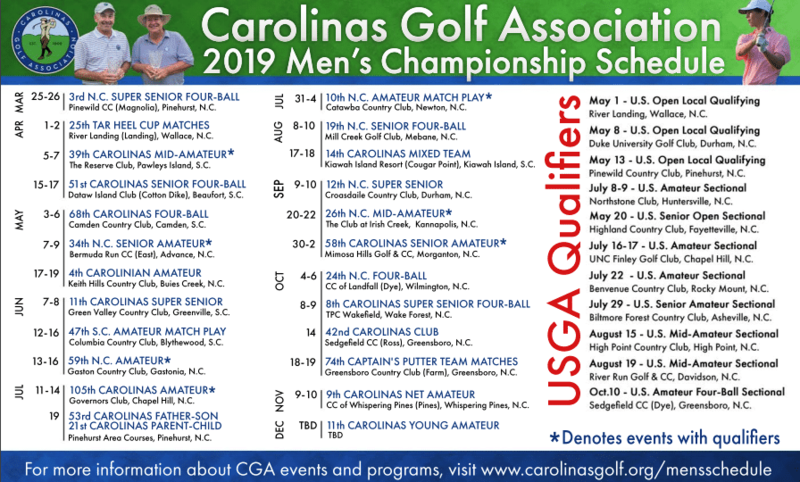 5 players advanced to the 39th Carolinas Mid-Amateur Championship that will be played at The Reserve Club in Pawleys Island, SC. Eric Lipson of Charlotte, NC earned medalist honors with a score of six-under-par 66. The cut line fell at three-over par, 75. 22 players advanced to the 39th Carolinas Mid-Amateur Championship that will be played at The Reserve Club in Pawleys Island, SC. Nick Thompson of Vass, NC earned medalist honors with a score of three-under-par, 69. 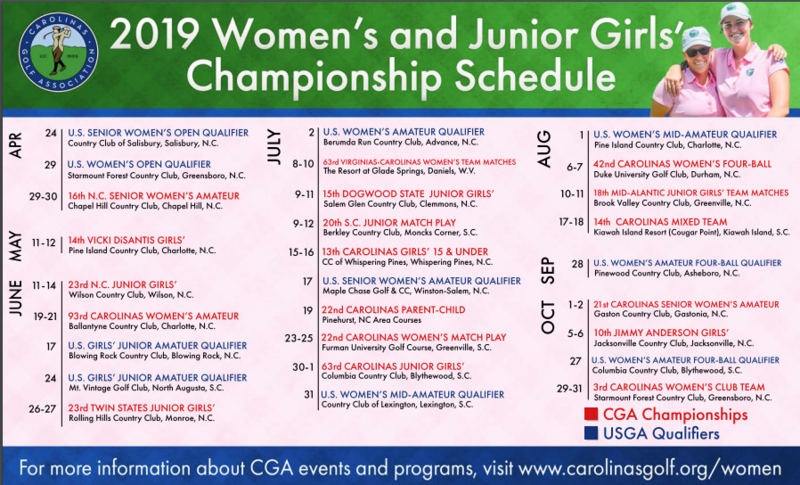 SOUTHERN PINES, N.C. — The Carolinas Golf Association (CGA) is pleased to announce a substantial update to the Carolinas Junior Boys’ and Girls’ Ranking Systems. In the past, rankings for both South Carolina and North Carolina golfers were determined separately. With the updated rankings system, the two programs have now merged into an easier-to-understand format. SOUTHERN PINES, N.C. (January 16, 2019) - Ben Payne of Greensboro, NC has been selected as the recipient of the 2019 Charles E. Lynch, Jr. Distinguished Service Award by the Carolinas Golf Association (CGA).